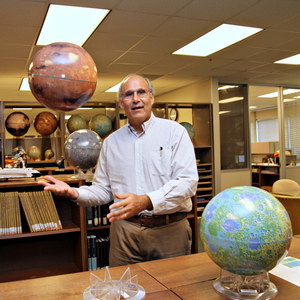 Dr. Allan Treiman studies planetary materials, particularly Moon rocks and martian meteorites. From these rocks, he teases out the early histories of the terrestrial planets (including large asteroids), emphasizing their volatiles — water, halogens, carbon, etc. His background is in chemistry, and he approaches planetary sciences from both geological and thermochemical perspectives. Allan’s current work emphasizes: Mars mineralogy (as a co-I with the CheMin instrument on the MSL rover), volatiles in the lunar crust, the origins of martian magmas, and serpentinization in relation to astrobiology. Earlier work includes diverse topics like: groundwater in Mars, as revealed by clay and carbonate minerals in martian meteorites; crust-atmosphere interactions on Venus; metamorphism in large water-rich asteroids; and water-deposited minerals on the asteroid Vesta. This research core has spun off work in other fields of planetary science. Work on the martian meteorite ALH 84001 led to studies of terrestrial analogs, the AMASE expeditions to Spitzbergen Island, and astrobiology. Work on water in martian meteorites led to investigations of possible surface manifestations of Mars water, the martian gullies. Allan Treiman is active in science education. He has worked in many teacher-training field experiences on volcanology (central Oregon, Yellowstone, Cascade Mtns. ), extreme environments (Owens Valley, CA; Yellowstone), and general geology (northern Arizona & New Mexico).